what the -hay- is a clafoutis? Remember this from last year? 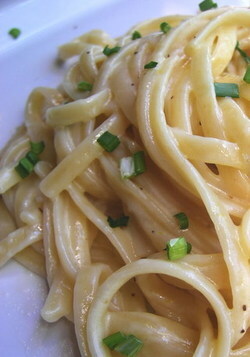 It’s my Lemon Linguine that I contributed to Barbara’s (from Winos and Foodies) LiveSTRONG event called A Taste of Yellow. I am busy working on a post to take part in the event today…but I wanted to make sure everyone knew about the event and that the deadline is SATURDAY. – For all of those people in Atlanta, we are lucky to be hosting a fabulous new event this year: Wine Enthusiast’s Toast of The Town on April 17th, 2008. 30 local restaurants (including favorites of mine like Ecco and Woodfire Grill) will be serving dishes alongside over 60 wine and spirit companies for a really delicious evening. In case that wasn’t enough of a draw, it’s being held at the Georgia Aquarium! We will be attending and bringing a wrap-up of the event – a good way for those of you not in Atlanta to take a peek at a bit of our food scene! The event also takes place in Chicago and San Francisco. Information and tickets can be found here. – Do you have trepidation about cutting up those whole chickens? One of my favorite food blogs done by a fellow Atlantan, RowdyFood, has posted an interesting and easy-going video about butchering a chicken. Once you’ve breezed through that, you can move on to Step 2: perfecting your Southern Fried Chicken. – If you prefer bacon over chicken (and I’m not going to say who doesn’t), check out this video of the ultimate BLT – a pound of bacon barely being held together between two flimsy pieces of bread. Can you hear your arteries clogging as you watch? – For those people who need to drink their meals, check out the site for MeatWater. This is seriously one of the most brilliant and creative projects I’ve seen in a while. I have very much enjoy your blog. I wanted to thank you for your excellent and inspiring work by passing on a nomination for “E is for Excellent”. That wine thing sounds pretty cool. Thanks for the info. I’m volunteering to be the Official Photographer for runningwithtweezers! All I ask is that you take me to the GA Aquarium event. Leave it to the Photo Assistants to find the ultimate BLT! my nephew once ate an entire pound of bacon at a sitting. i assume it’s something only a 15 year old boy can (and would) do. drat! i totally meant to do something for livestrong but missed the deadline.